Story: I love Kakori!! I have never even been there but I love it! I can't think of any other city in India that has its name linked to famous freedom fighters and super-delicious kebabs! Until I tried this recipe from SK guruji the only thing I knew about the place was the famous Kakori train robbery brilliantly planned by Ram Prasad Bismil and Ashfaqullah Khan in 1925 as a part of the indian independence movement. No - I am not into history at all.. the credit goes to Rakeysh Omprakash Mehra for writing and directing the brilliant movie "Rang de basanti". So here's to Sanjeev Kapoor (SK guruji) and Rakeysh Omprakash Mehra! 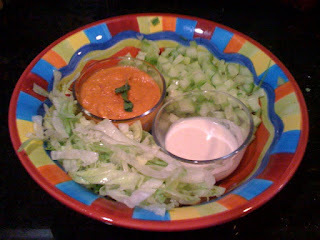 1 tbsp red chili powder - the original recipe calls for a yellow chili powder - I don't know what that is.. 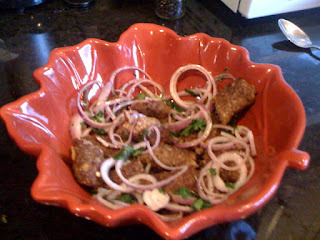 Here's a link to the original recipe and here's how I made it: in a small cup grind ginger, garlic, soaked cashew nuts, poppy seeds, garam masala, salt, red chili powder. 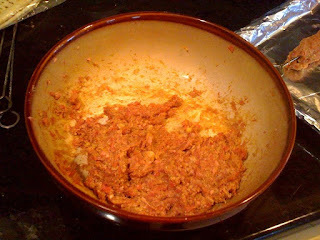 Add this mixture to the minced lamb and mix well. Now add ghee and mix well. 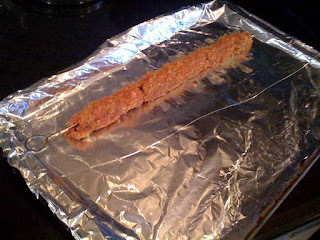 Make long slender cylinders out of the minced lamb and put skewers through them. 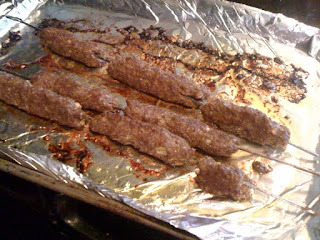 Bake in the oven at 400 F for 20-30 minutes till the kebabs look darkish brown. 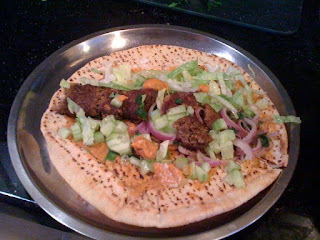 Spread the dips on the pita bread, add lettuce, cucumber and Kakori kebabs and make a kebab wrap. This calls for a standing ovation for you :) Well played! I had once made a similar thing with minced chicken and made it in a flat, round shape and had it in a burger bun with lettuce, mint chutney , onion etc..
hmm burger is a good idea.. we will try it when you are here in summer!